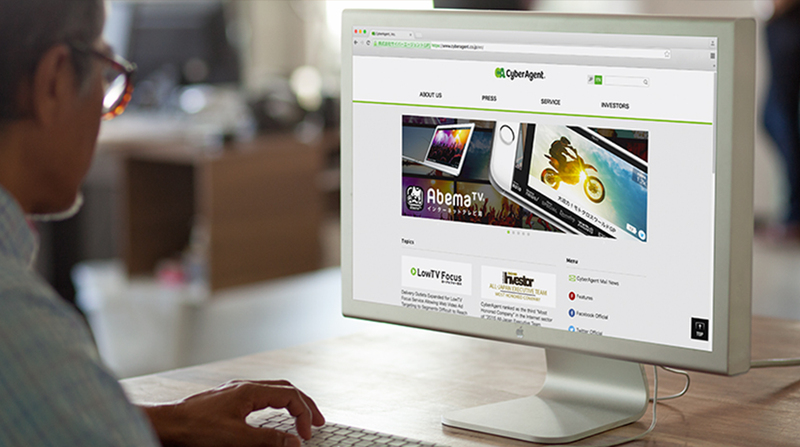 CyberAgent is a leading internet business with subsidiaries in areas like advertising, community, and gaming. CyberAgent is also the parent company of Ameba, a popular Japanese social networking and blogging site. Before Tableau, CyberAgent used different analytics tools and infrastructures for each of their products. Creating reports required scripting SQL queries, which slowed down production time and delayed insights. Ken Takao, Infrastructure Manager, Technology Strategy Department: Since Tableau was introduced to us, we have been gaining a data-driven mindset. Before, we would depend on our experiences and intuitions a lot in many aspects such as ad distribution, logistics, or how to increase our sales. Tableau: Tell us more about CyberAgent. Mr. Takao: We have been conducting our business to become a company representing the 21st century in the internet industry. There are four business departments in our company: advertisements, community, gaming, and Ameba. Mr. Takao: Our department is called AdTech Headquarters and we are in charge of advertisements. We have more than 20 products in our AdTech Studio and we use Tableau to analyze those products. Tableau: How has Tableau impacted you personally? Mr. Takao: As I have used Tableau, I have gained an ability to think with data in mind. It used to take too much time to see a huge amount of data in a report. But Tableau now helps us with reporting because dashboards can be created quickly. We used to depend on our experience and intuition in many things such as ads distribution, logistics, and how to increase our sales, but now we are depending on Tableau. It’s a big advantage. Now we can discuss such strategy with certain data. Mr. Takao: We used to use different analytics tools with different data infrastructures for each product. BI tools were used for some products, but not for every product. So we had different data visualizations for all products. But we unified the data visualizations with Tableau. Tableau enables us to visualize data so quickly that we can now detect error values and accesses that we could not detect before in usual operations. Tableau is so useful that we can also access various KPIs of ad distribution. Tableau: Tell us more about your data sources and storage. Mr. Takao: AdTech is a system for advertisement distribution, which means we always have to handle a vast amount of data. We handle dozens of petabytes in Hadoop and hundreds of nodes for Redshift. Data storage varies from BigQuery and Redshift to Hadoop. There are also some use cases of using as data mart by importing data from MySQL and CSV files. Basically we use MySQL to store the master data for most of the products. We blend the master data on MySQL and data on Hadoop or Redshift to extract. Tableau: What roles use Tableau at CyberAgent? Mr. Takao: Data scientists, application engineers, and server-side software engineers. They use Tableau to create a dashboard as a report for their managers and sales team. Tableau: How much of a difference does that time savings make? Mr. Takao: Without Tableau, when we would have to output a report with data, we need to consider how to get the data before scripting SQL queries. With Tableau, however, data can be extracted directly from data sources. This shortened the time it takes to acquire insights. Tableau: What benefits have you experienced from using Tableau Server? Mr. Takao: Tableau Server has a major advantage which can be accessed through a website. It’s sometimes difficult for our customers to install an application to their PCs to see data, but Tableau Server is quite useful because our customers can see data on Tableau Server once their account is issued. Tableau: What do you recommend to others considering Tableau? Mr. Takao: I would recommend them to use a trial version. They cannot help choosing Tableau once they connect it to the data source and play with it for an hour. Tableau is so easy to use. We can generate a report by just clicking a mouse without reading operation manuals. There is also the Tableau community where I can find a solution to a problem that I cannot solve by myself, but by discussing with other users. With these benefits, I will recommend people interested in Tableau to start with a trial.